I would like to extract part of the merger tree of some subhalos which follow main progenitor branch, but I want to extract, apart of the first progenitor line, every subhalo which merged with first progenitor line. I used full trees (onlyMPB=False option in tree function).I tried to identify subhalos using algorithm: find all subhalos in i-th snapshot which have descendant ID equal to the subhalo ID of the subhalo with most massive history on ( i+1)-th snapshot (which is in first iteration our subhalo in 135. snapshot). It's very simple algorithm, and it works for about 85% of the starting subhalos, but for about 15% of the sample identifying subhalos with same descendant ID breaks and gives me empty sub-dataframe. I can't find fault in my algorithm as much as I try, so I thought maybe to ask if you have any ideas (and if this isn't type of question you usually answer, I sincerely apologize ). As you can see, for the 26-th subhalo we have breaking of the algorithm on the 43-rd snapshot. If you have any ideas, I would be very greatful. The merger tree algorithms are generally allowed to "skip" one (or possibly more) snapshots in locating a descendant. This is because a given subhalo may temporarily disappear (i.e. 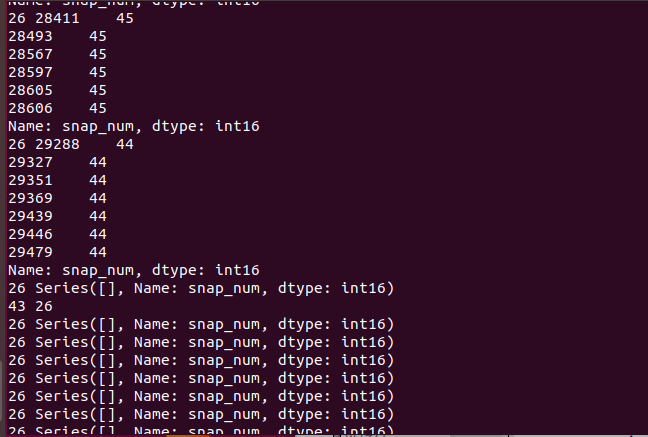 not be detected) by the substructure finder, for a given snapshot. This might be what you're seeing - i.e., if you can adapt your algorithm to consider, if it doesn't find a match on (i+1), then to consider e.g. (i+2). Thank you so much, Dylan, that helped tremendously!